There’s no denying that high expectations of a series are based on how outstanding its other titles are. There is so much I’ve come to expect of Atlus after I became an avid SMT with DS, SJ, and Nocturne, continuously open to dive deeper into their world. The Fall comes and Persona 4 anime is announced and there comes the moment when the biggest decision is to watch or not watch an adaptation of a game you hadn’t touched before. After some thinking I said to myself why not? Let’s just watch this. Originally I had my own plans for the Persona spin offs, but with so many months before that I’m more than open to watching the anime before that. Similarly originally I was also shy about getting into the Persona series after being unsure how I would like the different take it has compared to SMT. With so many months to wait and the chance to have a broad view of the series the Persona 4 the anime comes at the right time for me. + The TV adaptation is based on a popular franchise. It certainly wouldn’t be the first time but I’m almost as excited as those who actually played the Persona series. There is a decent/great story to back up the series no matter what path the anime takes from here. Everything will be up to the adaptation to make it work. + Staying close to the original. I read the description, watched a couple of clips about Persona 4 months before the anime was announced out of curiosity and I can see they kept some of the nice details of the game. 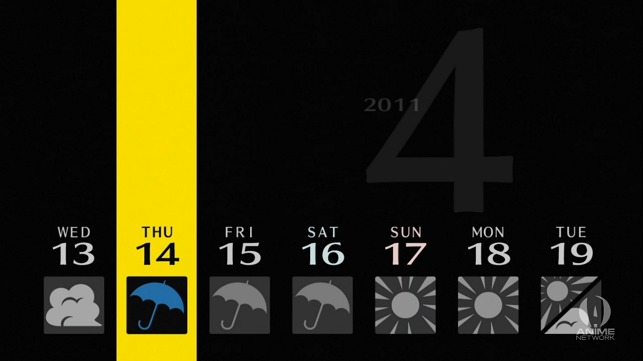 Personally I’m digging the calendar marking the days seen in the anime. Just seeing an adaptation keep some of the small details of a game would make any gamer happy. + Nice OP/ED themes and music. The BGs weren’t as strong as I expected them to be in the first ep, they were there but they weren’t prominent as much they could. I want a Persona that is sassier than that. + It’s a guaranteed to be a 22+ episodes show. For a game of such magnitude and story there is no better option than giving it a decent amount of episodes. – I’m a bit put off by the animation. I realize there is some strong resemble to the original designs that but there’s something about seeing them in anime that doesn’t always click right. My expectations of Persona 4 was that it was going to be a bit more upbeat in some ways. – Lastly, the first episode was a bit rushed. 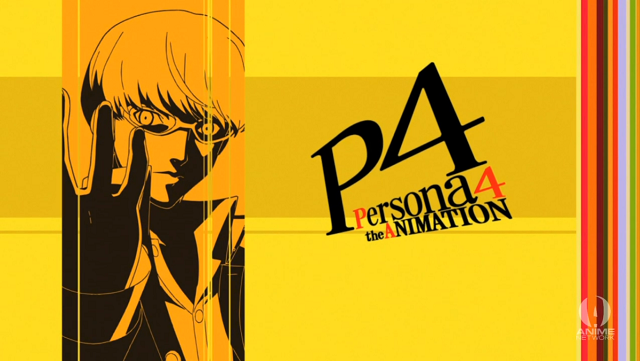 Looking forward to Persona 4 the animation fixing that issue and getting the pacing right for the remaining episodes. 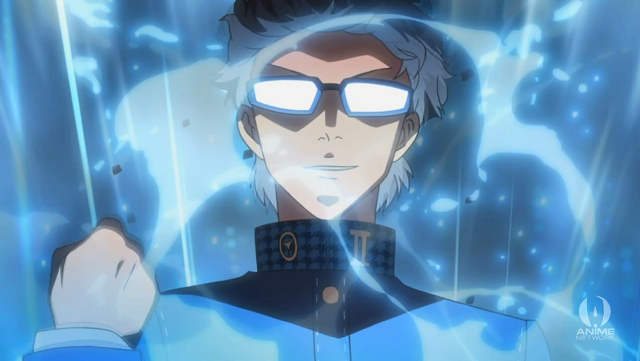 Compared to the lackluster and forgettable Persona : Trinity Soul anime which was confusing, Persona 4 is already a promising show. Knowing the high caliber of the SMT series first hand and expecting the Persona series to be in a similar league I’m more than ready to see Persona the Animation be another massive hit this season. Persona. This entry was posted in First Impressions and tagged adaptation, new anime, persona 4, thoughts by keikakudoori. Bookmark the permalink. i’ve wanted to play P3 and P4 for some time now since they’re quite popular, but i guess i’ll watch this anime first. Looks promising. I’ll get around playing P3 & P4 sometime next year. Sure, the anime will spoil me quite a bit but there’ll be lots of stuff the anime won’t be covering too. Also I look forward to getting a feel for the series by watching the animation. I’m still torn over playing P4 before and then watching the anime or watching the anime and then beat the game. I believe that the adaptation will not be that good, considering that game adaptations are usually…. subpar and because of pacing issues: If they plan to include Social Links and such, it might be a bit hard to do that and SLs are part of the “heart” of Persona. (I know it from experience, I’ve been playing Persona 3 for a while, almost finished with it). I am curious if they decide to include Social Links. Would they include the animation for them, as well as distinguish any of the arcana they belong to? You’re right, I LOVED seeing the calendar progression and the stats increase during the cuts. It was really awesome seeing your stats increase and go from a moron, plain coward to a genius, charismatic, badass in P3. And I would love to say I told you, Shiki is awesome. I’m really glad you watched it until the end. SL choices are up to the player, right? If that’s the case then I’m curious about what decisions and routes the animation will take. I guess they’ll go for the cannon/most standard route, huh? Well, I’m in no rush, but I’ll definitely want to play the Persona games at some point. I think for now the animation will do nicely. Well, It’s a choice of one before the other because right now I’m on an exchange and I don’t have access to a PS2. So yeah, that makes the waiting more difficult. I could just go and watch the anime and as soon as I get back to my homeland, I’ll play the game non-stop. Well, SL are up to the player, but it is adviced that you do them, since in-game they have a double benefit. The higher your SL level is, the better experience you get when fusing personas of that Arcana. And if you have a persona of the same Arcana when you do the social links, you get a bonus and you might increase a level faster. Both Persona 3 and Persona 4 include Social links that are directly related to your partners. There are some other extra-ish links as well. I don’t know exactly the number of plot-relevant SLs in P4, so they might be able to cut them just to fit the plot. Shiki went from dropped to put “on-hold” (my put on hold shows vary from a couple of months to unknown) to finally watching. Once I started watching again I finished the series AND the specials in the same day (remember I dropped Shiki around the 11th episode). Wow, I’m surprised at how much stuff Shiki was holding back on us. Even the lead became badass and the Doc. Damn. This was one of those shows that I’m glad I picked up again. Heh heh. I never dropped the manga, even though I suffered from months of no new updates and I forgot what was happening. But all the build-up was really, really worth it. Shiki is not a series you can easily explain without spoiling something, and a lot of people might have dropped it before the big point, which was episode 18, if I recall correctly. It requires patience, and I think the show rewards that with the way everything unfolds at the climax/end.